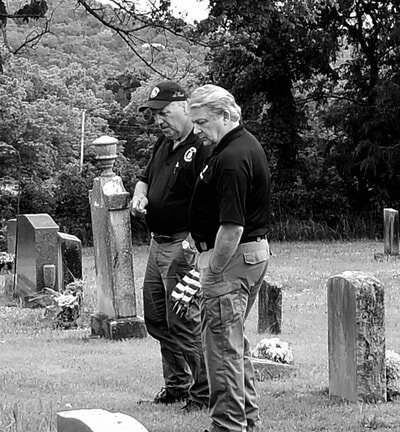 Members of Squadron 147, the local squadron of Civil Air Patrol honored our nation’s fallen heroes at McCullough Cemetery in Shell Knob on Thursday evening, May 24. While Memorial Day is often spent with family and food, its primary purpose is to honor the men and women who died while serving in the United States Armed Forces. This is the 3rd year that Squadron 147 has placed flags beside graves at the McCullough Cemetery. Squadron 147 meets every Thursday evening from 6:30 – 8:39 pm at Branson Regional Airport in Hollister. Adults of all ages and youth from 12-18 years of age are encouraged to become a part of Civil Air Patrol. Come visit with us and see how you can be of service to your community, state and nation. ​You may visit our website at https://capmo147.com/ or our Squadron Facebook Page at Table Rock Lake Composite Squadron. Pictured are 2nd Lieutenant Gary Kempf on left and 2nd Lieutenant Stephen Lind, Deputy Commander of Squadron 147. 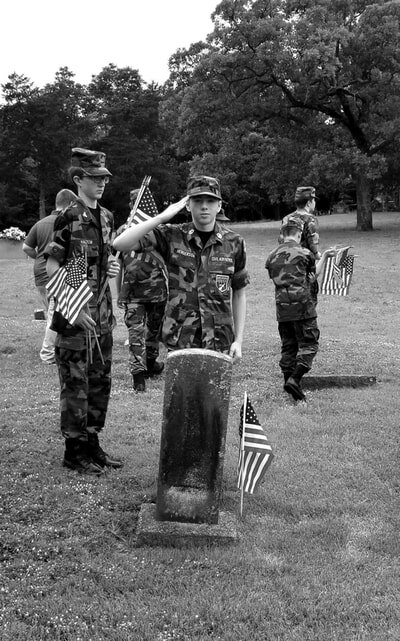 Pictured above are Cadet Airman First Class George Haltom on left and Cadet Master Sergeant Bradley Henderson, saluting.